With fall right around the corner, Renee Press’—with Fire and Earth Kitchen—Apple Pie Bars seemed like a very seasonally fitting recipe to share. I haven’t personally made or tasted these bars, but given Renee’s very positive track record of offering this blog various delicious recipes, I’ve no doubt this one also will be fantastic. If you decide to give this recipe a try, please take a few moments to comment after you’ve made them! I’d love to hear about the end result! Put all of the dry ingredients into a large bowl and whisk to combine. Put all of the wet ingredients into a separate bowl and whisk to combine. Line 9″x9″ baking tray with parchment paper. Make sure the parchment paper goes up the sides of the pan about 1″. Fold in the apples and pour the batter into the pan. Spread the mixture out to the edge of the pan and bake for 15-20 minutes, or until golden brown. Let the dish cool slightly then lift parchment from tray—carefully flip over onto a cutting board and remove the parchment paper. Let cool before cutting into squares. Dust the bars with powdered sugar for an extra hint of sweetness! Printed it out to try later! Please let us know how they come out! Thanks, Lauren! I made these with the addition of some allspice and cardamon. Really nice treat. Not too sweet and goes well with tea. 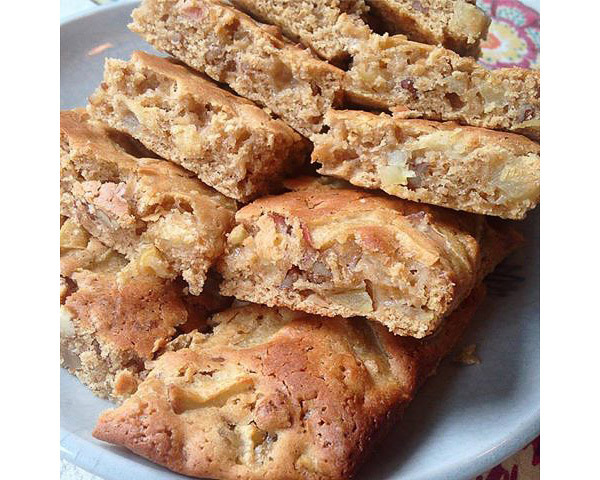 I am so happy to hear you enjoyed these apple pie bars, Nim! Thank you for your comment!